One of the questions I am frequently asked is, "what is 00 flour and how does it compare to English flour?" This is swiftly followed by, "I am making focaccia/ciabatta/white bread out of the strong, stone ground English bread flour that you suggested I use and it is not turning into the Italian bread of my childhood. What am I doing wrong?" Let's take these questions in turn. 1. Italians and English do not categorise flour in the same way. Italian flour is graded by colour (technically called extraction rate - that is the extent to which the bran and the germ are extracted from the flour). It is marked 00 to 04 where 00 is really really white and 04 is rather closer to whole meal. The exception is Durham flour but let's not go there now. English flour, on the other hand is graded by both colour (white, brown, whole meal) and by gluten content, or strength (plain, strong, extra strong or words to that effect) and we believe that the stronger the flour, the better the bread. All else being equal, stronger flour makes bread that rises higher and has a more evenly textured crumb. 2. Different flour bakes different bread. Bake the same recipe in the same way with 00 flour and with stong white flour and you will see that the 00 loaf is flatter and the crumb has holes that are different sizes and are not evenly distributed. Bake the same recipe in the same way with 00 flour and with strong white flour that has been stone milled and you will see that the 00 loaf is white white white and the stone ground loaf is a bit beige. This is because the stone milling mills for whole meal flour and then seives it to separate out the bran and the germ, thus providing white flour. Industrially milled flour (of whatever strength) has the bran and the germ milled out at a very early stage because industrial millers mill for white flour. The lesson is that if you want the very white, soft, holey bread from your childhood you need to get the flour from your childhood. The big difference, in addition to texture and look, is that the stone ground white flour is higher in the naturally found nutrients because the white flour absorbs some of the nutrients from the bran and the germ before they are seived off. Industrially milled flour is rather bereft of these nutrients because the bran and the germ are removed so early in the process. For a more comprehensive discussion about this, please click here. You can make perfectly lovely Italian bread with English flour. It may not be identical to your Italian experience but it will certainly be better for you. And when it looks like this, why not choose better for you as well. Proof the yeast if necessary and then knead all the ingredients together for a good 10-15 minutes. Turn it out and either leave as one blob for a big focaccia or cut it into equal pieces for smaller ones. You will need baking trays/forms with sides at least 2 inches high at this stage. Give the pieces (or piece) a good knead on a lightly floured board and then flatten into your baking tray (s). Cover witha damp cloth and let rest for 30 minutes. Take the cloth off and dimple the dough vigorously with your knuckles or fingertips. Cover and let rise for 60 minutes or until the dough has doubled in size. It should reach the tops of the sides of the pan. It will not, therefore, be 4-6 inches high. Rather 1.5-2 inches high. You get a much better crispy oily top to lucious, smooth dough that way. Not too oily, not too dry, not too high. Meanwhile pre heat the oven to 230 degrees. Brush the top of the dough lavishly with olive oil and sprinkle salt, herbs and anything else you want on top just before you put in the oven. Spary a few times with water or even salt water if you like in the first 10 minutes of baking. Bake for 20-30 minutes. Don't let it burn or go dry but don't let it be doughy either. When it is a deep gold it will be done. Turn out immediately onto a drying rack so the bottoms don't go all soggy and eat straight away. This really does not keep well. If you would like to try this among friends with some supervision, why not take a class? 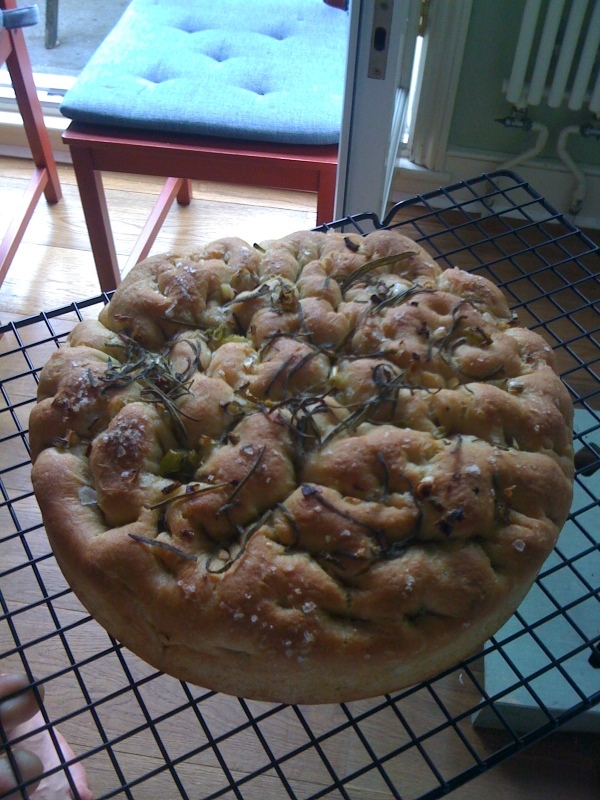 Virtuous Bread is offering focaccia classes throughout the summer! Click here for information. So interesting. I think I assumed that Italian 00 was better - but your explanation makes me realise it's just different. Thank you Sally, for commenting! I am glad we could help. After the first knead, put the dough in a bowl and put plastic wrap on it. Put it in the fridge for 8 hours (or so) to rise. Then shape it into your loaves and either let it rise on the counter for 3 hours or put it back in the fridge for another 8. The longer it take to rise the more digestible it is - and that is another problem with commercial bread. Some factories take as little as 45 minutes to make the bread. We recommend a minimum of four hours. Flour, given that it is simply raw grass seeds, is hard for us to digest so it needs to be well broken down (this happens in the rising process) for us to eat it without getting a tummy ache. Was VERY interesting to read about Deb's comment above. I too had been going thru horrible stomach problems off & on for many, many years. I had my water tested twice, thinking this was it. It was normal water. My husband & I recently went to Italy for vacation and I was able to eat anything & everything: bread, pasta, pastries, pizza, gelato, espresso, etc. without any stomach issues!! I was so happy for once. When I got home, I was telling a neighbor this and she being a French trained chef, told me that the flour/wheat in Europe versus here IS in fact different. So, I decided to stop eating anything made with American wheat/flour and feeling much better and will be having only De Cecco pasta and ordering flours from Italy. What's gong on in America?! 3. a lot of wheat in the US is highly modified to do things like resist disease, increase yeilds, contain various vitamins and contain a VERY high gluten content. Naturally occurring high gluten flour has 13-15% gluten. This is considered really high - great for bread. Some strains of US wheat have been bred to have over 30% gluten. This wheat gets mixed with other wheat and gets used to bake/cook and make pasta. In addition, it is grown for its gluten, which is stripped out of it and turned into a non animal source of protein for vegetarians and vegans. Also, remember, the bulk of the US grain crop is fed to animals so a higher protein grain will have a different impact on the animals to which it is fed than a lower protein flour. The point is that this is a man made crop and what is beginning to be clear - although medical science will dispute this utterly - is that this wheat may be one of the things that is making people ill. I am neither a scientist, nor a nutritionist, but I am a baker and I do talk to a lot of people who have experienced really distressing illnesses by eating highly processed wheat flour and highly processes bread and flour products. You can get good wheat flour in the US but you need to look for it. Get stone ground and get it from a mill. Look online and do your research. Ask how it is grown, how it is milled, and what the gluten content it. Organic wheat, with less than 15 % gluten (round 8 for cake and pastry; around 10 for all purpose; around 13 for strong bread flour) that is stone ground is the best you can get. Don't be fooled by a photo of a wind mill on the package. Don't be fooled by the label "organic" - it is not synonymous with quality in growing or milling and ask about gluten content so that you know you are eating as natural a product as you can. I am one of those who take an appliance out of its box, plug it in, turn it on...and then read the manual when the buttons don't work as expected. Today I have launched into my first attempt to bake bread. I had a kilo package of 00 flour (probably 2 yrs in a plastic bag in my ref) mixed 6 cups with 3 cups all purpose, etc according to a simple no-frills recipe (which did not tell me what the hell was all purpose and 00 flour). I decided to look up what 00 flour is, but I don't know if the all purpose flour made in the Philippines is the same as US flour (probably, since source it is a US brand affiliate). I found your info very enlightening, and frightening, as I'm now anxiously waiting for the dough in the pyrex bowl to rise. In the Philippines, we don't wish for the best. We pray for it. BTW, about gluten and allergens or things that make you sick. Ab out 20 yrs ago, I noticed my body seemed to react badly to certain breads. I thought the same was happening to my then 2 yr old godchild, and his pediatrician told me there was no medical finding that bread, or yeast caused allergies (I didn't then relate it to gluten). Looking at the huge difference in Novak Djokovich's amazing performance (and, obviously, well being) after he dropped gluten from his diet, my gosh, people had better take heed. Certainly there are more strange harmful things in our diet than our philosophy dreams of. As I've learned since 2 hours ago, the 00 flour I had available in my ref may not be the best to use in bread, as it apparently won't rise the way other flours do. Hopefully the all purpose in this dough I made will hel;p. I now wish I had a source to tell me what tyo do with the mix I have. Like turning it into other products. Since I have already begun, I'll just proceed and learn from the experience, and look forward to making successful bread soon. I am sure it will be great! Everything is good toasted - even if it's ugly!!!! In fact you might LOVE it and never want to do anything else again! It's true and it's complicated - we are all different and there have been massive changes to our diet in the past 100 (50, 25, 10) years that our systems cannot cope with. Everything in moderation works if you are healthy and living at a "normal" pace. Stress, training for an event (from childbirth to Wimbledon), illness etc change our systems and require changes in the diet. There is no doubt that we are what we eat - but we are very complicated! see above - it will be great! can I use 00 Italian flour to bake muffins ? yes you can! they will be a little "worthy" because 00 flour is typically (although not always) "hard" flour whereas all purpose or plain flour is typically what is used for muffins. But if that is all you have - use it! "It is not an allergy (there is no known allergy to wheat) but it clearly is making you ill and it is not the gluten?" Actually I Am allergic to wheat and Not gluten intolerant. It's entirely possible (I had my allergies tested so I'm not just assuming)! Unfortunately, Deb I just have to make my own substitutes and be selective with food when I eat out or travel. I only use wholemeal stone ground organic non gmo flour. Yes 100% wholemeal without any other flour. It is is a little bit more difficult to make the dough but it works and it is healthy. I do not use salt and sugar. Flour, natural yeast, extravergin Olive oil. Have you ever wondered why lots of bread out there (especially us and uk) have lots of ingredients? Natural is a few and of the best quality. That's the secret of Italy! Regarding flour 00, if you want to live well forget it! Flour 00 the worse rubbish could ever been invented. The flour remains without nutrients and full of glutine. It became popular because it is fast to rise and easy to process. It is common nowadays to add extra nutrients to this flour to try to remedy to the damage created. Of course it remains rubbish. But don't think this flour 00 is only in Italy... It is also in the U.S. and U.K. just called differently. I am Italian living in Singapore. I have recently come to the point of thinking that the only way is to buy the grains and and home mill and grind your own flour. Either here or in Italy. All very interesting and enlightening information. Thank you. My son has decided to make some pizzas for his kids as a surprise, so I had to go to supermarket and buy oo flour. After he made the dough he asked me what is oo flour? So naturally I googled it! Its amazing the difference one ingredient differs to another even though you think it's the same product. Thanks again. You are welcome! In fact you can use any flour for a pizza base. 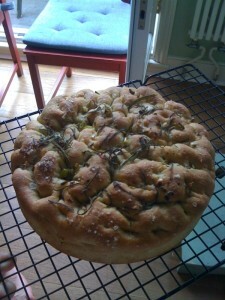 And if you want a super super easy recipe (does not require kneading) have a look here: http://www.virtuousbread.com/bread-and-conversation/seriously-delicious-and-easy-no-knead-pizza-dough/. Have fun with it! Trying to follow an American bread recipe using English flour does not work. The hydration levels they obtain with American flour are quite extreme. My daughter was put on a diet the only bread she was allowed to eat had to be made with Frenchy flour!! It worked. I have notice how the dough is manipulated also affects the hole size of the finished loaf. Dear Eric, I wish it was that simple. When you buy the flour, when and where the grain was grown, where it is processed and how it is processed all contribute to its performance (level of absorption, final size of loaf, structure of crumb, taste, colour, smell, etc.). French and Italian flour have a higher level of enzymes processed into them at point of mill than, for example, English flour. This makes them more active - more holes in the final dough all else being equal - than for example English or American flour. Italian flour does not have to be fortified with folic acid whereas in the US and Canada it must be fortified with synthetic folic acid (by law) and that includes organic white flour and white rice too. The problem is that 30% of the population has a genetic polymorphism that prevents them from metabolizing folic acid. The most frequent complaint is profound fatigue. If this sounds like your reaction then you need to avoid all folic acid. Natural folate in foods is fine but the synthetic folic acid added as a fortifier is not good. Import your flour from Italy, bake at home, check all labels and supplements. Hope this helps. I do hope that you won't go through all the trouble to import flour 00! import something healthy, not flour 00! I've been a bread baker with my own business for 40 years and I've finally found out what 00 flour is!! I've built a 2 meter wood burning oven based on one I found on a French farmhouse and used it to bake bread and pizzas for our open garden last week. I could do 100 loaves a batch but limited myself to 50! I am so sorry - I do not know! I think you mean durum, not Durham! My main reason for being here is trying to find out whether 00 wheat flour used for focaccia is the same as 00 pasta flour. I can't find 00 wheat flour anywhere, and 00 pasta flour didn't turn out well at all. I'm in England, so I'm looking for it in a local shop, and certainly not by mail order. ahhhh auto spell - thank you for that catch. 00 flour is 00 flour - just highly milled. If you bought it to make pasta it should be a very hard flour and I certainly use a hard flour when I bake focaccia. I don't use 00 for anything other than pasta because I like some bran and germ in my bread - even if it's white. What was wrong with your focaccia? If you let me know, I may be able to help you buyd the flour you would like to achieve the result you want. I have been away on holiday. I am going to try again, as it was so long ago that I can't even remember what was wrong with it. I will report in a day or two. I had another try, and made some great bread, which stayed fresh for 10 days due to all the oil, but it wasn't focaccia. It was too firm, although it rose nicely.